They use two small sleds under the boat, one at each end. The little sleds were only about a foot-and-a-half long and about the same width. They used ivory for runners, which was very slick on ice. The people of St. Lawrence Island use large skin-covered boats (angyapiget) to hunt walrus and whales. Hauling boats across the frozen ocean to open water where the hunting takes place is a strenuous job, especially when the ice is broken and piled up into pressure ridges. Crews clear a pathway for the boats and pull them on top of small sleds like this one, which has runners made from whole walrus tusks. The holes at the front are for attaching a pull rope. Ralph Apatiki, Sr.: Qanraaftut. Angyaq qaayngakun piluuku. Navek alngunak entaqun. Anguksakaqanka atuuluki. Ukuk qanrak sikulgunghani kevagyaq taawegkuk yugek. Merlin Koonooka: Tamaniqun sikukegtaq sikuliiq tamana eslakeglluku. Ivaghim neqmeng. Repall tagtalmi qikmimengllu atughyagutut. Quunpeng angyalgat sangwaa nuyekliq sivullgaaghaqelghii uunghighluni. Neqenneghmeggni qamuusimaghmeng elngatall angyameggnun qaakluki. Naangqus tamakut sikumi qiighnalghiit elngatall. […] Maaten sikugput allangughtekek esghallemnni. Taaganingani enkaam esgha maakut atuupiguftut. […] Iwernga taaganingani teghik qantaghanlenguq. Estelle Oozevaseuk: Enankin liisimakanka [I know it for sure]. The name of it is qaanrak [small sled to haul skin boats over ice]. Branson Tungiyan: These have more than one use, but the main use was normally for skin boats. Two would be used, one up front and one in the back, to transport skin boats over the ice. (1) And there might be other uses for them as well. Estelle Oozevaseuk: I think around the island, they have different way of making them. But they always use ivory for the runners, which is more [durable]. Qamun [sled runner]. (2) Some of them [other materials] wear out, like wood. The latest ones I’ve seen are [made] with wood about this high [approximately two feet], like a little sled, with ivory runners, and bigger than this one. Estelle Oozevaseuk: They use it for when they come from somewhere with heavy things to unload. They use them for unloading too. Our beach is up high and there’s something like that clear down to the coast. They’d try to keep them [away] from gravel. I think they put a piece of walrus skin, just a scrap they used there, putting it between these two [sleds]. And then put the meat up on it and pull them up. 1. According to St. Lawrence Island Yupik Elder Vera Kaneshiro, her father used a qaanrak up until the 1960s or 1970s. 2. According to Vera Kaneshiro, qamutek means “pair of sled runners.” Qamutek were made of ivory or bone then metal. 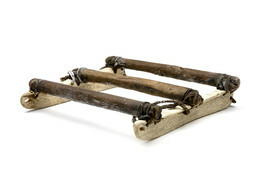 The boat sled has runners carved from whole walrus tusks and crosspieces of wood, lashed together with leather thongs. Holes at the front edge of the runners are for attaching a pull rope. Roger Silook remembered the use of traditional sleds like this one: “They use two small sleds under the boat, one at each end. The little sleds were only about a foot-and-a-half long and about the same width. The used ivory for runners, which was very slick on ice.”(2) Boats sleds could also be used for hauling other loads.